Tropes: second chance, reunion, childhood sweethearts, snowed-in, forced proximity, compromised, scandal, road-trip, makeover, friends-to-lovers. 170,000 words, 28,000 - 40,000 per novella. All proceeds will be donated - the authors aren't being paid for this anthology. Content Notes can be found after the Copyright page. When Scarlet Fever forced Emerson Lindt to move to England, her only consolation was Brady MacInnes's promise of writing-letters that never arrived. When she returns to Scotland years later, Brady is adamant that he never betrayed her. And though poverty plagues Scotland and stretches Brady's pocketbook, their love for each other flares anew. Can a Christmas miracle and the spirit of giving finally grant them a future together after they were denied marriage so long ago? Five years after breaking Amelia Chilson's heart, he's back. Robert Danbury wants the mistletoe kiss Amelia denied him years ago, but nothing more; loving a woman again is an unthinkable risk. Then they're caught innocently in bed together and Robert has an instant to choose: Amelia's reputation, their lost love, or his conscience. When he stole her first kiss one Christmas, Tobin Everleigh didn't realize it would be ten years before he got another. Saffron Thomas is determined to forget the kiss and the boy who called it a folly. When fate brings them back together for a holiday celebration a fiery game of Snapdragon gone wrong and a midnight dash through a snowstorm proves their attraction was no game. Georgiana Throckmorton is eager to return to social life after years of isolation in the north of England. 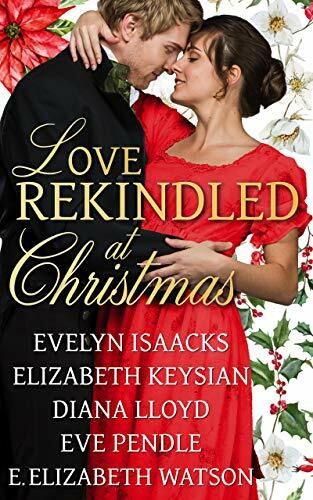 When she's invited to spend Christmas with an old friend she never expects to be reunited with her first love-Alexander Forrester, who ran away to the sea after he made love to her. Passion reignites once again, but past hurts loom over their second chance at love. For this review I won't be doing individual reviews, mainly because it would take up too much time. As a whole these books are lovely to read, especially when it involves Christmas. There was a couple of the books that I found slow and it took me awhile to connect with the characters, so for me I give these 3/5. The others were brilliant and I was able to connect with the characters from the first page, so for me I give these 4/5. the book is pre-order at Amazon UK and is released on 1st November. I received this complementary copy in return for a honest review, all thoughts are my own.